After the Pan Pond, one goes around the garden and arrives at the Lingxing Gate. A Lingxing Gate is necessary for any Confucius temple and it is placed in the front. In the Qu Fu Confucius Temple, for example, the Lingxing Gate is built like an honorific arch. The Lingxing Gate of the Confucius Temple in Zhang Hua, Southern Taiwan, has a roof and is like a tower with a gate underneath. 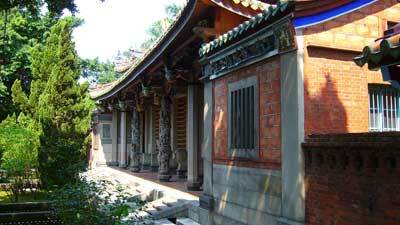 The Lingxing Gate of the Taipei Confucius Temple is as wide as seven normal sized rooms, and its roof is in the hip-and-gable style which makes it look like a Buddhist or Taoist temple. In this respect, it is completely different from the Qu Fu Confucius Temple. In the middle of the entrance of the Lingxing Gate, there is a pair of beautiful coiled dragon stone pillars. Most of the stone used to build these pillars were brought over from Quan Zhou. There are two kinds of stone. The blue-green color type is called Chingtou stone, while the ivory color type is called Quan Zhou white stone. Besides the dragon stone pillars, there are also all kinds of flower and bird patterns carved on the walls. These carvings are in a simple style that brings out the gracefulness of the Confucius Temple.